Samsung Galaxy S8 and S8 Plus are now officially launched in Samsung stores worldwide and indications are it will break all sales records. The one disappointing thing about the Galaxy S8 models is it will have limited features of “Bixby” – Samsung’s own digital assistant just like Siri. Samsung is now the latest competitor entering the digital assistant market and will now directly compete with Google’s “Google Now”, Apple’s “Siri” and Microsoft’s “Cortana”. It’s believed that Bixby will be ready later this year and currently Galaxy S8 users can only enjoy its limited features like Shopping unless you are using a Verizon carrier Galaxy S8. The Verizon S8 users are currently facing issues with Bixby but, it will be resolved very soon with a new software update. The statement from Samsung also confirmed that, the Bixby is available in every Galaxy S8 model and the Verizon featured S8’s issue are not related to hardware. Samsung Galaxy S8 models will also feature the Google’s digital assistant “Google Now” – However, once the Bixby is fully functional. We have to see whether the future smartphones will allow Google digital assistant alongside Bixby. The default Bixby button on side cannot be changed. Which means that primary digital assistant in S8 models will be Bixby even though it’s not fully functional. Samsung has built its digital assistant in-house with the team of developers who are behind the invention of Siri and later sold it to Apple Inc. In current conditions Bixby is supporting more than one language which includes Korean and Chinese alongside English. Bixby has three parts – “Bixby Voice“, “Bixby Vision” and “Bixby Home“. Bixby Voice works just like other digital assistants either your can call it or press the side button. While Bixby Vision will help you in searching a book or any other product online (eg: price or features) and even purchasing it through the Camera app. It’s designed in such a way that Bixby will see everything through a camera just like us – It can also help you in translation of any text into any language you choose. The current state of Bixby will not deliver all three features completely but, once its launched fully activated we can only expect great things from the Samsung’s digital assistant. 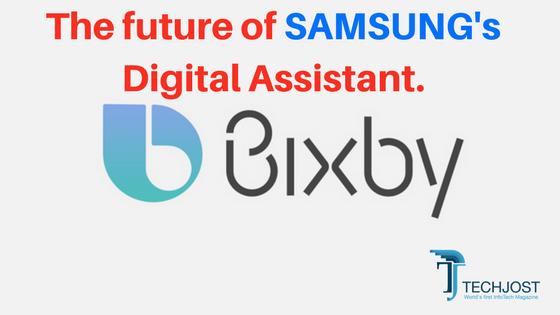 One major aspect which sets Bixby apart from all other digital assistants is its ability to detect How and what the Samsung user is doing with their applications. If the user wants Bixby will be able to take control of the device or app at the point on which the user left his smartphone. This feature will help in managing the workload of Samsung users something, which is very compelling. If Samsung delivers this completely functional feature this year there are no doubts that, the future of Bixby is much brighter than all its competitors. Right now “Google Now” is the market leader of digital assistant market.